Before and after our trip to Iceland, one of the first things almost everyone that knows or follows me asked was if I’m going or if I went to The Blue Lagoon. After an almost 6 hour flight, spending what seemed like forever in the car rental office, shower, lunch and a quick nap, visiting the Blue Lagoon was the first activity on our group trip to Iceland. If you’re planning a trip to Iceland and want to visit the Blue Lagoon, read along to see if it is worth spending your money. The Blue Lagoon is one of, if not the most popular attractions in Iceland. Although Iceland has many natural hot springs, the Blue Lagoon Iceland is a man-made geothermal spa. The warm waters are rich in minerals like silica and sulfur and water temperature in the bathing and swimming area averages 37–39 °C (99–102 °F). 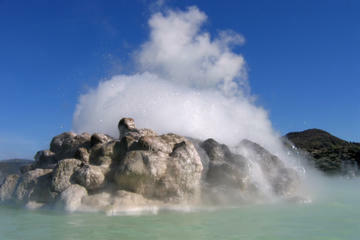 The Blue Lagoon also operates a research and development facility to help find cures for skin ailments like psoriasis. The Blue Lagoon caters to visitors 2 and up. If you travel to Iceland with kids between 2-13, admission is free. There is a two child under 10 limit per adult and children ages 2-8 are required to wear floaties. The wristbands given to visitors of the Blue Lagon upon arrival has many uses. DO NOT LOSE IT! It is a key for your locker as well as a “credit card” in the spa area. If you are purchasing drinks or snacks in the spa area, your wristband will be scanned and you will be charged any fees upon departure. Changing rooms, lockers, and showers are provided on site. Lockers are to store all valuables including jewelry, cameras, clothing, and shoes. Before leaving the locker room, make sure it is locked properly. The silica in the water causes your hair to be stiff. Apply a conditioner to coat your hair before getting in. The Blue Lagoon provides complimentary conditioner, but you can also bring along your staple hair products. As mentioned, temperatures in the Blue Lagoon can be extremely hot. Make sure to drink plenty of water to stay hydrated. Save some money and drink the water from the fountains instead of buying from the cafes. Iceland’s tap water is totally safe to drink and refreshing. If you wear prescription glasses, do not submerge them in the water because the silica can damage the lenses. It is also recommended to take off contact lenses due to salt and other minerals irritating your eyes. The Blue Lagoon is located 20 minutes from Keflavík Airport and 50 minutes from Reykjavík. Due to its closeness to the airport, I suggest having it be your first stop after landing (or your first excursion) or visiting a few hours before departure. There are hourly departures from Keflavík Airport and Reykjavík, so if you’re worried about transportation, roundtrip tickets are available for about $45 and can be booked with your admission ticket. Comfort Package – ($58) Entry, Silica mud mask, towel, and drink. Premium Package – ($82) Entry, Silica mud mask, towel, drink, a second mask of choice, robe, and slippers (We booked two months in advance and paid $127 with taxes and fees). Luxury Retreat Package – ($652) – Four hours at the Retreat Spa, private changing suite and unlimited access to the Retreat Lagoon and the Blue Lagoon. Below is a list of what to take and what to wear at the Blue Lagoon. Bathing Suit – You’ll be in a heated pool. Swimsuits are required. Water shoes – Water shoes aren’t necessary and the grounds of the pool aren’t rocky, but if purchase the Comfort Package, buy some water shoes with non-slip soles. Hair tie – If you have long hair, bring a hair tie and put it up in a bun to help avoid the silica minerals from drying out your hair. Lotion & Moisturizer – To apply after taking a shower. You don’t want to be out there looking ashy. Deodorant – To apply before leaving the Blue Lagoon. Camera – Don’t forget to bring your camera or smartphone to take pictures. Bringing a waterproof camera is a bonus. Something to carry wet clothes – Bring along a plastic bag to put your wet clothes in when you’re done. Waterproof phone pouch – To capture pictures in the Lagoon with your phone, get a waterproof phone pouch. Get Silica and Algae Masks – The silica masks come with the packages and algae masks can be the additional mask if you purchase the Premium Package. Enjoy the Sauna and Steam Rooms – One of my favorite parts of a spa day. If you’re unaware about their benefits, read my post. Have a Drink by the Lagoon Bar – There is a three drink maximum at the Lagoon Bar for hydration purposes. Drink choices included smoothies, juices ciders, wine and sparkling wine. Soooo…is the Blue Lagoon Worth It? After my visit to the Blue Lagoon Iceland, everyone had the same question “Is the Blue Lagoon worth it?” Honestly, I will say yes and no. If you are a “do it for the ‘gram” traveler, it’s worth the pics and videos. Social media is one of the reasons this place is so popular in the first place. I also believe that not visiting the Blue Lagoon Iceland is like traveling to Bali and not going to the Bali Swing; it is nice, but not necessary and will not make or break your experience in Iceland. We visited in the winter on a weekday afternoon so there wasn’t a lot of people, but depending on the season, the Blue Lagoon can become very crowded. Even though the price is standard or even less compared to spa prices in NYC, I could’ve visited one of Iceland’s natural hot springs for a lot less. Have you visited the Blue Lagoon Iceland?